OVERCLOCKING... ANOTHER PATH THAT LEADS TO, THE DARKSIDE! "Feel however you want. Your opinion still has all the appeal of a warm, flat beer." "PLEASE HELP US MR. RED!" Just to make things more interesting, bits 22-20 of reg 0x94 control the DRAM speed (200, 166, 133, 100 Mhz). There are several reserved values, and I decided to try 110. Surprisingly this gave me a mem speed somewhere inbetween 200 and 166 MHz. This may be a 183 Mhz mem option  I need to test some more to confirm these results. As you can clearly see on the tREF "Discrepancy" Table, the only two places where A64 Tweaker v0.60 Beta and Memtest86+ v1.6 agree, are in the highlighted blue sections. Now you can see why this is an issue. Not only because my tREF Table is based on your program, but because ALL the other simple tREF Tables, everywhere on the internet, are based upon your A64 Tweaker program. I cannot state, explicitly, that either program is wrong; I simply do not know the answer to this problem . There is, however, a British guy over at DFI-Street who keeps challenging the validity of my thread's claim because he professes to "know" that your program is wrong! He sites his belief that A64 Tweaker v0.60 Beta is invalid based solely upon the only Ã¢â‚¬Å“proofÃ¢â‚¬Â� he provides, which is that programs like RightMark Memory Analyzer, Central Brain Identifier and of course, Memtest86+ v1.6 all agree with each other, but disagree with your A64 Tweaker v0.60 Beta. I am not so quick to jump to this conclusion the way he is, however, because it is obvious to me that since all those "other" programs corroborate Memtest86+ v1.6, they are plainly reading the tREF data in the same manner. Given that A64 Tweaker v0.60 Beta is reading the tREF data differently than Memtest86+ v1.6, it obviously won't correspond with those other application's readings. Can you please help us by telling us which one is accurate and which one is in error and why, or if neither one is wrong, why there is this discrepancy? Thank you very much CodeRed . I wish this issue is looked into by CodeRed or someone knowledgable w/ Tweaker's program and solve this problem. Yes, I agree and I do believe that this is a real issue, but just so that everyone is crystal clear on this point, I did not bring this to your attention to be mean or a jerk-off critic. I did this to try and genuinely resolve the issue. Regardless of what is or isn't correct, or whatever the case may be, I think that A64 Tweaker is fantastic, as are programs like CBI and RMMA. I just hope that CodeRed looks into this for all of us. I also think that CodeRed is a great programmer too . Just so you know RimRam, to my knowledge, EVEREST only shows a refresh as is preprogrammed on your DIMM as it is reserved in the RAM's SPD. It is Memtest86+, Central Brain Identifier and RightMark Memory Analyzer that conflict directly with A64 Tweaker. EVEREST, like PC Wizard 2005, only displays the Serial Presence Detect, EEPROM that is right on your memory stick. The tREF I am concerned with is the one that can be adjusted in your BIOS on your MotherBoard. I also would like to point out that I know for fact that A64 Tweaker is 100% correct on all the other data it displays. The tREF is my only concern here. Do they show the same on bootup? Many programs can't recognize if you changed some timings within windows via A64Tweaker. I've never had any issues with other programs reading the "Tweaks" I've made while using A64 Tweaker, and the BIOS always reverts back to its original CMOS setup, from an A64 Tweaker adjustment, upon reboot. The A64 Tweaker's conflicting tREF data is always consistently there, however. I have a problem I overshot one of my values and after my system locked and reboot now all my tweaker values are the values at the bottom of the drop menus and it wont let me change anything. Please help me anyway you can I'm very good at all tweaking just below this level any help would be greatly appreciated. I'm using the .60 version. P.S. Sorry been awhile since Ive asked for help. Yes I've reinstalled. Not sure of anything thing else I should have tried or left out. \/\/\/\/\/\/freecable guy u are the man!!!!! thanks allot!!!!!! I'll save space and not ad another post for my noob problem. Last edited by ColdFlo; 02-08-2006 at 02:10 PM. 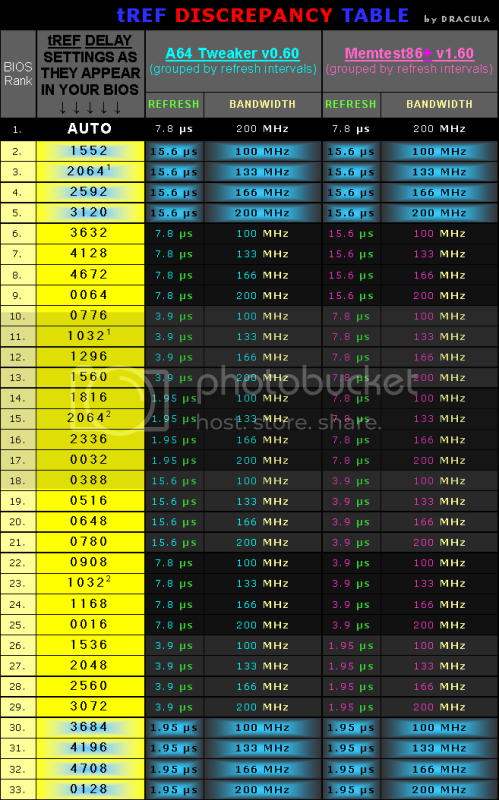 Column Address Strobe # (CAS) = 1.5!!!!!!!!!!! Thank you oh god of the RED CODE HE WHO IS KNOWN AS CODERED. I shall forever be in your dept. May all my CLIPS POUR INTO THE FACES OF MINE ENEMIES AND CAUSE INSTANT DEATHS!!!!!!!!!!!!!!!!! Last edited by ColdFlo; 02-08-2006 at 04:16 PM. can anybody tell me how to remove A64Tweaker-v031 ??? The program wasn't actually "installed" on your system, in any conventional sense. Just DELETE it. The assembler code looks really interesting and this idea is similar to the ROMOS project. but there was no reason for this. Well, I just would like to know what values have I to replace with xxxxxx? Codered you ready for a windows 7 update?!!!! these old amd X2s are great on windows 7 would be very nice to have this app at disposal in windows 7.